The Basenji is a small to medium sized dog weighing between 22 to 25 pounds. Their height is around 15" to 17". Known as the barkless dog, the Basenji (bah-SEN-gee) makes a low howl/moaning/yodeling sound instead of barking. They are also called the Congo Dog. The smooth, shiny, dense coat is short and lies flat against the body. AKC acceptable colors for Basenjis are black, chestnut red, tricolor or brindle all with white on chest, feet, and the tip of the tail in any color including pinto, white or brindle. The coat is easy to care for. Basenjis are also known for licking and grooming their hair like a cat. This high energy dog makes an excellent watchdog. They are slow to warm up to strangers and will alert you if they see a stranger. They need a lot of exercise and play. Since they are a little on the independent side, they also enjoy some alone play. Chewing is one of their favorite pastimes, so load them up with toys so they don't pick your favorite pair of shoes as a chew toy. They tend to no do well with non-canine pets. With early socialization, they can do well with children and other dogs. Because they possess a little bit of an independent nature, early training is recommended to help curb any unwanted behaviors. 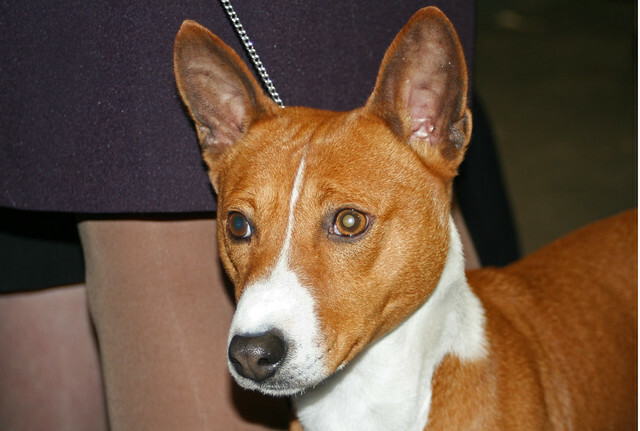 Originating in Africa, the Basenji dates back to ancient times in Egypt. Pictures of the Basenji are on the walls of ancient Egyptian tombs. They are mainly used as watchdogs in Africa to warn others of the presence of wild game and they often hunt wild game as pack dogs. Just because the Basenji does not bark, does not mean that they are a meek, quiet lap dog. They are very energetic and need plenty of play and exercise. 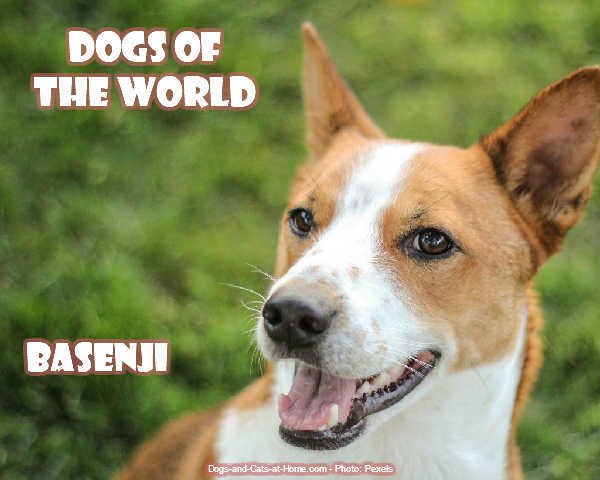 They are perfect for homes that enjoy outside activity and will make sure that their Basenji has time to run and roam. The following paragraphs summarize the work of Basenji dog breed experts who are completely familiar with all the aspects of Basenji dog breed. Heed their advice to avoid any Basenji dog breed surprises. The dog Basenji goes by many names, some of which include Belgian Congo Dog, Bongo Terrier, Congo Bush Dog, Zande Dog, and Congo Terrier. What makes this breed particularly special is that he is the only breed who has no bark. But other than the absence of bark, this breed will whine and growl like other dogs and can express his feelings with a unique yodel or chortle sound. The Basenji does have a vocal cord. However, it is believed that the past thousands of years of training to hunt game silently may explain his characteristic quietness. Nevertheless, this breed is recognized for its gentle nature and love of children. He is very inquisitive, mischievous, does not have any doggie smell, and adaptable to most climates. He can be wary of strangers and does not like the rain. He has a number of appealing features, including his curling tail, high set and lying over to one side of the back, his wrinkled forehead that gives him a worried-like look, and his habit of washing with his paw similar to a cat. Size: The ideal height for the male Basenji is 17in at the shoulder while the ideal height for the female Basenji is 16in. The ideal weight is 24lb for the male and 21lb for the female. History and origin: This type of breed has been depicted in many carvings in the tombs of the Pharaohs. It is said that these dogs were brought as valuable presents by travelers from the lower reaches of the Nile. The breed almost disappeared from public sight during the ancient Egyptian times until the middle of 19th century, when the Basenji was again discovered by explorers in the Congo and Southern Sudan. Feeding: Recommended feeding for Basenji is about 11/2-2 cans of quality dog food (13.3oz size) with an equivalent amount of biscuit or 3 cupfuls of dry food. This breed will also enjoy an occasional serving of green vegetables. In addition, the Basenji is a grass eater and should have plenty of access to fresh grass. Exercise: This breed is a terrific hunter and has a tendency to put on extra weight unless he gets plenty of exercises. He is tireless, fleet-footed, and loves to take regular walks and runs. He is an indoor dog that should not be put in an outside kennel. He would love to just relax next to you and lie down in a corner. He is a great apartment dog as long as he is given enough exercise. Grooming: A hound glove is recommended to keep his coat in great condition. There's no doubt that the topic of Basenji dog breed can be fascinating. If you still have unanswered questions about Basenji dog breed, you may find what you're looking for in the next article. Hunting dogs, though traditionally used for hunting small game including foxes, rabbits, and others, have become household pets to many. Intelligent, graceful, and energetic, these dogs can bring joy and comfort to any home. Hypoallergenic hunting dogs are available for those who have problems with dog allergies. Three popular breeds include the German Shorthaired Pointer, the Afghan Hound, and the Basenji. 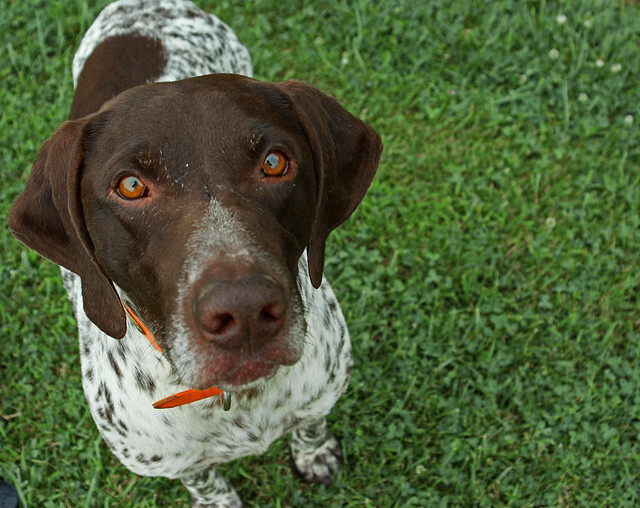 The German Shorthaired Pointer still used for hunting purposes today is also considered a good choice for a family dog. The dog has a short coat that can be brushed easily. A short coat will not shed as much as longer coats and will not hold as much dander either. This is why the German Shorthaired Pointer is an excellent choice for those who suffer from allergies. Long and lean, these dogs are very friendly and enjoy getting their exercise. Not much extra care is needed as the dogs do not have to be groomed often and they should only be bathed when they are extremely dirty. A cross between a German Pointer and an English Pointer, the German Shorthaired Pointer is a good dog to have when on a hunt. The dog responds to noise and movement very quickly and is a loyal companion to have when outdoors. The Afghan Hound may not look like a hypoallergenic dog with its long hair, but since the hair is similar to human hair, the dogs do not shed as frequently, which cause fewer allergy issues for owners and those who visit. While this dog was once used to hunt foxes, wolves, and deer, it is no longer used today. Instead, it is kept as a pet or for dog shows. With its beautiful brown coat, this dog is a showpiece. The Afghan hound is a pleasant dog, but it does not take commands as often as it should. Unlike other hypoallergenic breeds, this dog will ignore commands made by its owner on occasion as it tries to maintain its independence. If you are looking for a dog that is easy to control, the Afghan Hound may not be the one for you. The Basenji is one of the few breeds of hypoallergenic dog that does not bark. It will imitate sounds heard in its environment, but it does not bark on its own. Instead, the dog will yelp once or twice, but otherwise, it is a very quiet breed. If you live in an apartment, this dog is a good choice. Small dogs that originated in Africa, the Basenji is no longer used for hunting. The dog has shorter hair that does not shed as often. This is another reason why it is a popular hypoallergenic breed. The Basenji , like the Afghan Hound, does not take commands too often from owners. The dog is quiet but likes to explore new places. This dog has been compared to a cat in terms of its behavior and temperament. While you may be able to train the dog to perform certain tasks, many times the Basenji will not want to obey.